When I was a young mother with three small children living in a bad neighborhood, I prayed to St. Jude to intercede for us. We needed a home in a safe neighborhood. Just by chance I heard of a program for low-income families. I bought our new home only to find out that the parish it was in was named after St. Jude. Forty-one years later, I still live in my home enjoying the community of St. Jude the Apostle Church! Thank you Saint Jude for taking care of our daughter and helping her heal from a long period of emotional stress. We prayed for both our children and our prayers came true. We asked for Saint Jude’s help and he guided the hand of a doctor and provided a direction for our children. My wife went into the hospital for 51 days. She was on life support. Her kidneys and liver shut down. All of our kids, grandchildren, and people from our parish were praying for her. Father gave last rites. I didn’t leave her alone. I said the Rosary all day everyday. With all the prayers and good doctors, she made it after being hospitalized for 51 days and having doctors say she wouldn’t be going home. She is home. She needs oxygen an has to move slowly, but my wife – the woman God gave me to share my life with – is still with me. I thank St. Jude, Mother Mary, an especially Jesus Christ – God. I also thank everyone who helped pray. Thank you Saint Jude for helping my son find work. As a young pre-teen I prayed every night for my parents to be able to have their marriage blessed in the Church. I never stopped even as I grew up. After I had married and had three children, I got a call from my father one day saying he and my mother were getting their marriage blessed in the Church. After I hung up I sat down and thought, “Oh my God it really works, prayer really works.” I have never stopped thinking about that day. My dad was so happy. They were able to live the rest of their lives receiving the Eucharist and the other sacraments they waited so long for. Thank you Lord for my Catholic upbringing and parents who deserve any graces they have received from you. I’m sure they are with you in Heaven now. That is a comfort for me as I try to live my life for the same goal. Thank you Saint Jude for all the blessings bestowed on me. Dear Father Gabriel, I love Saint Jude and Our Blessed Mother. I have been praying to them so much this month. I have the relic of Saint Jude on a small card with my prayer. He and the Blessed Mother have helped me so much. I am 90 years of age and I know how many times they have blessed me. Thank you for saving my son from a tragic accident! I needed Saint Jude the most when my identical twin was being mentally and physically abused by her husband while she was pregnant with twins. After the babies were born my sister left and moved in with our mother. Her husband’s behavior continued and he became more abusive. She had to get a PFA [protection from abuse order] on him. This didn’t mean that she didn’t have to allow him to see the twins. It was very scary and he did something every time they had to meet. After months of this, my sister kept going to court to show that her husband was not fit to be a parent. Finally, after a year and many prayers to Saint Jude, the judge took all of his rights away. It was a miracle. Soon after this I named my own son Jude after Saint Jude to show my thanks. Thank God that twelve years later my sister’s girls are doing well. 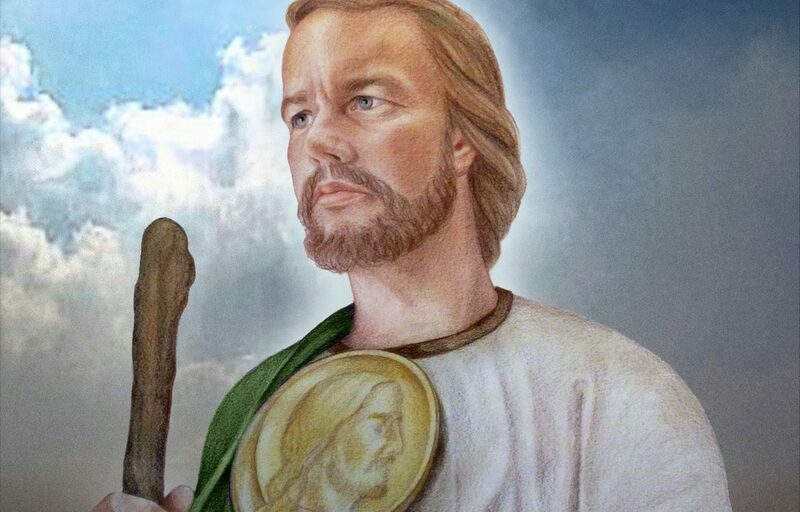 Saint Jude has been my patron saint for 45 years, and in times of need when I’ve asked him for help for myself and my family he has always pulled through for me. I love you Saint Jude – my patron saint forever. Amen. Dear Dominican Friars, My mother loved Saint Jude. She prayed to him for my son who was asthmatic when he was small. Praise God: he is now 38 and healthy. Anytime there was a crisis, no matter what, she always clung to Saint Jude as her direct line to the Lord. I always appreciated and loved her for it but had never really prayed to Saint Jude for help myself. Last summer my husband was hospitalized during our vacation and after a massive dose of antibiotics developed a C. Diff infection, which is a horrible illness. After six months of medicine and trips to the doctor he was finally declared clear. During this horrible time, I received the chaplet rosary of Saint Jude and started praying it each morning, always asking Saint Jude to help my husband, who was not only sick but depressed and worried about his health, so much so that sometimes it was hard to engage him in conversation. Saint Jude heard me, and my husband was cured! I requested another chaplet rosary from you and I promised Saint Jude to give it to the first person who would claim it as a thank you. I posted on social media that anyone who needed the rosary was welcome to it because St. Jude had granted me a miracle. In less than 10 minutes a friend claimed it. She is caring for her ailing mother and prays it every day.